Mehndi Madness proudly offers quality product for home and professional use. All products are shipped out in about two days unless we indicate otherwise. There is not a pick-up option available at this time. We only ship product within the United States! 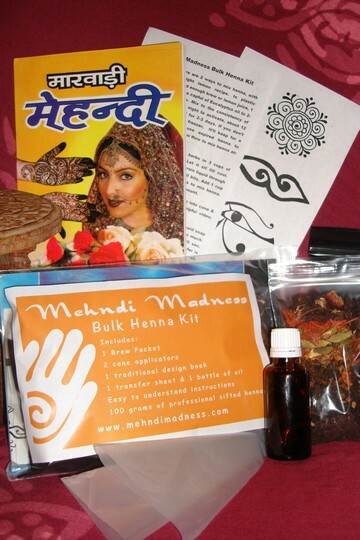 Our largest home Henna kit includes 100 grams of quality Henna, 1 large bottle of oil, 1 brew pack, 2 heat-sealed cone applicator, 1 design book, 1 stencil pack and our easy to follow instructions. We recommend mixing your Henna with lemon juice for best results.